ALLEGRA BOVERMAN/Staff photo. Gloucester Daily Times. 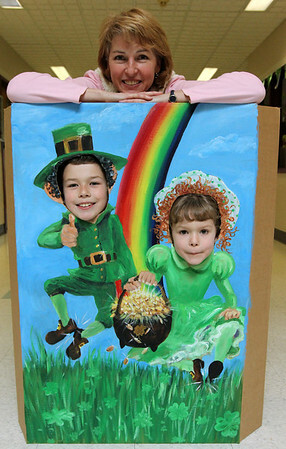 Tina Lamond, who works at Rockport Elementary School, with her Leprechaun cutout that she painted by hand and will be used for photos during the schools's first Lucky Leprechaun St. Patty's Day Dance set for 5 p.m. to 8 p.m. on Friday evening at the school. Her children, Sam, left, a third grader, and Natalie, a first grader. Cost to attend is $5 per child. Hair feathers are $12, the photo booth is $1. Children in grades K-2 attend from 5-5:30 p.m. and Children in grades 3-5 attend from 6:30 - 8 p.m.